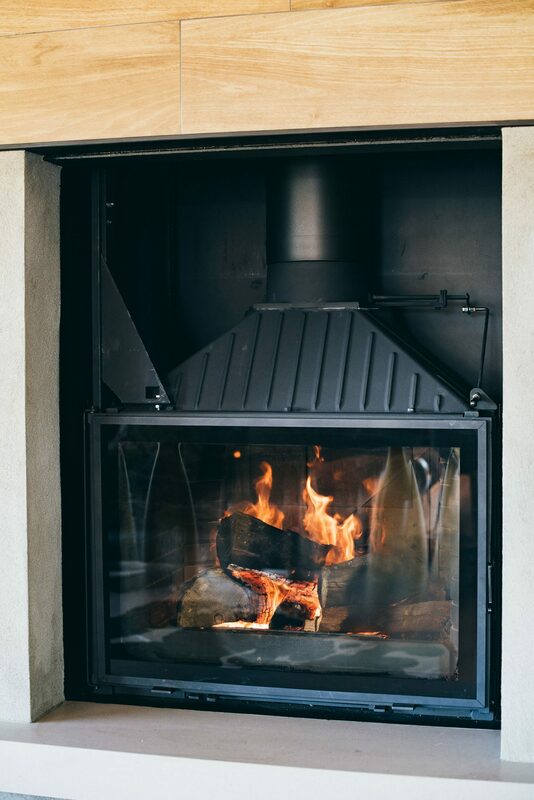 This Cheminee Philippes fireplace was the perfect statement piece for this contemporary rustic home and in complete context with it’s native surroundings. The property is nestled away in one of Tasmania’s wine regions, running aches of gorgeous green land with scenic horses roaming in direct view from this amazing, heavily glazed living room.The idea was to create a living room that drew on the naturalness of the property, introducing materials that reflect the client’s lifestyle, the land and ultimately the best products that were going to enhance the look and functionality of the hero piece- Radiante 747 fireplace. 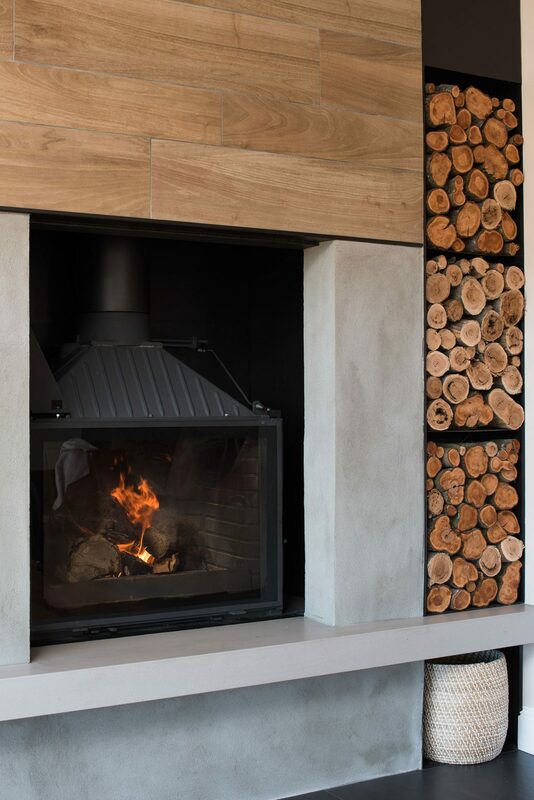 This fireplace was the first selection and everything came thereafter, so we’ve essentially designed around the Radiante fireplace and used materials in a contemporary way to modernise and complement it. We’ve layered up the different materials, horizontal timber look tiles spanning almost the full length of the room to really elongate the space with a fine 8mm steel plate that runs parallel, which then forms the framing for the wood box. The top of the steel wood box also acts as a funnel to distribute the heat into the hallway with dual air grilles, a perfect alignment of function meets aesthetics. The use of vertical axon cladding painted dark adds depth and interest in texture whilst hiding the tv. This colour toning is then picked up in the storage boxes below to really accentuate the horizontal aspect of the stone bench. 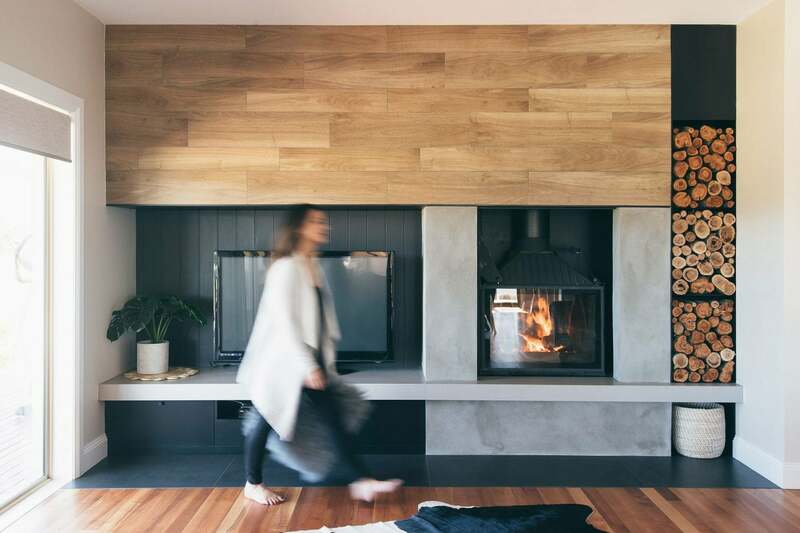 The construction of this fireplace really opened up opportunities both aesthetically and functionally when creating this design. With the whole front sliding up for a stunning open fire coupled with the stunning view, this living room is a sophisticated, cosy and breathtaking interior space.